Written by Amanda Chesin and Christian Ortega. Hey everyone! We’re Amanda and Christian, two recent interns on the Enterprise Architecture team in Phoenix, Arizona. 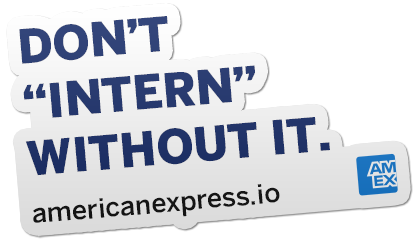 We’d like you to offer you a peek into our intern experience at American Express. Amanda: Right off the bat, I was immediately impressed by American Express’ onboarding process. I was welcomed on day one with an orientation, and when I finally made it to my desk, my team gave me some fun presents to kick-start the great times I would be having! Something I didn’t expect was being part of a three-member team (me plus two others), but it turned out to be a cool new dynamic that I’m glad to have experienced. My team engages in constant positive reinforcement to motivate each other to achieve their goals, which I’ve found is a really great leadership strategy. Being from the Phoenix metropolitan area, I knew what to expect weather-wise, but I didn’t know what to expect work-wise. Not all interns have the same experience, but I actually got to decide on my second day what project I would work on for the next 10 weeks. Earlier on that second day, I also made my first pull request for a widely used Mac internal application that set the bar for how much I would be achieving this summer. Christian: New town, new faces, but same ole’ nervousness. I had no idea what to expect my first week here. Sure, American Express flew me and other prospective interns to Phoenix last fall for a few days of the Amex experience, but I was terrified nonetheless. Turns out, I had absolutely no reason to be. On my first day and to my surprise, I was provided the latest technology and equipment, which helped get me started faster than I thought possible. My hiring leader Rick was very welcoming. He introduced me to the team, explained what they had been working on, and what he thought would be a good project for me to complete this summer. A great first day, even considering the fact that I had locked my keys in my car just ten minutes prior to meeting Rick. The days following were exciting, fun, and productive. The effort my team put into integrating me into the group clearly showed in their actions, whether that was including me in daily stand-ups, assisting me in retrieving software I needed, or simply conversing with me to get a friendly dialogue going. I was impressed and all nerves I had carried blissfully disintegrated into thin (blazing Phoenix-hot) air. Amanda: While I cannot talk about the specifics of my project, I can tell you that I gained an incredible amount of knowledge over the ten-week internship. My team identified inefficiencies in the company and created tools to help speed up processes. We built software for internal use, to better the lives of those at Amex and help them produce better code. I was the project lead and got to make big decisions about the direction my project would go. Before this, I had never made an app in React, and now I can successfully navigate JSX and implement many features in ways I didn’t understand prior to this summer. I learned how important it is to have design-driven development and to start a project with a clear end-goal in mind. I understand how to import dependencies from npm and utilize them in my project. I understand the differences between client-side and server-side rendering, and see the pros and cons of both. I know when it would be important to use one rendering method over the other in regard to specific elements of projects. I know how important it is to test a project, but also how tedious, if imperative, it is to write unit tests. I learned about containerization and how simple booting up a project can be using a single Docker command. Christian: In any working environment, I greatly value my independence and autonomy. When appropriate, I like to learn, solve problems, and create on my own and with minimal help. That said, I knew that I would have to overcome this going in because getting stuck is inevitable, and guidance is necessary sometimes. The project idea that Rick presented to me sounded like the best of both worlds. It was separate from what the team was working on (as it’d take too long to learn what they had already done) yet would be integrated into their website. Rick put his faith in me and allowed me to develop my project on my own with a simple goal in mind. I loved this because I got to choose the libraries, APIs, and other technology as I saw fit, and really make this project my own while asking for help when I needed it. I learned more than I ever thought I could in a summer. Front and back-end development; usage of libraries like Node, React, and Express; and even artificial intelligence APIs were all foreign to me before this internship. I now feel confident that I’ve gained the skills and experience to work with everything mentioned to take on any challenge thrown at me. Amanda: Along with technical skills, I learned how valuable it is to get feedback from my leaders and peers. Asking for guidance on my progress and how I can improve creates an open channel for dialogue. I was lucky to have such a great team at Amex that effectively communicates and engages with each other. Our team lunches are something I will cherish because it brought us closer as a team. At a previous internship I did we never went out to lunch together, and I can see a tangible difference between how our team works and performs compared to my old team that didn’t spend that time together. Another lesson I learned was this: Always be willing to take a step back and try a different approach. This can be applied to coding and life. When you try something and it isn’t working, but you’ve already invested a lot of time into it, it’s hard to give it up. But that extra push to start from scratch and get something up and running in a better environment with more possibilities can have a positive impact. Finally, this internship gave me the confidence I needed in my coding skills. About a year and a half ago I was seriously doubting my skills as a software developer because of a poor school experience. Instead of sulking, I decided to put myself out there at the career fair last September to figure out not only if this was not only something I wanted to do, but also whether it was something I could do. I’m happy to say that both of those have proven true, and I’m really excited for my future as a coder. Christian: One of the major reasons I took this internship was to experience living in Phoenix. The mountains casually standing alongside the highways, the artsy art scene on First Friday, and the many beautiful towns and state/national parks constantly captivated me. I took road trips nearly every weekend, and even took a short vacation to Yellowstone National Park. The landscape is beautiful everywhere you go, so I’m glad Amex is located here. We both enjoyed the many events put on by our recruiters, including executive speaker town halls, social gatherings, and volunteer opportunities. 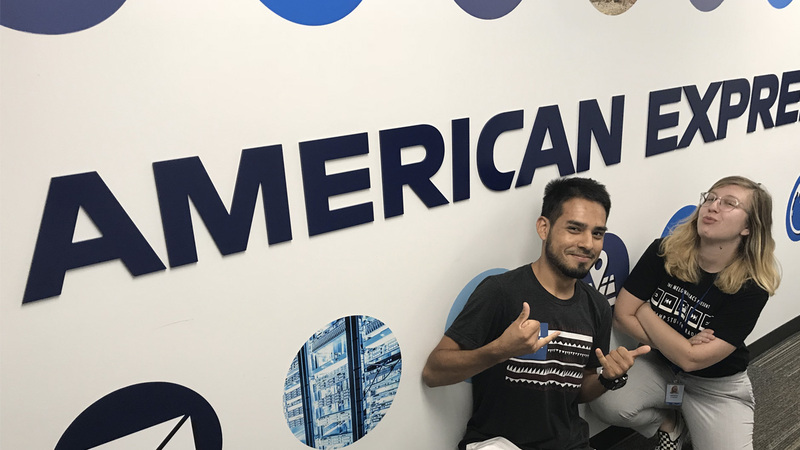 Amex helped foster the intern community feel that we experienced, and helped us attain the technical skills and corporate environment knowledge we sought to gain coming in. We both came in with the strict, overly serious, no-laughing stereotype of a typical corporation in mind, but American Express shattered the preconceptions by providing a naturally fun, hard-working and lighthearted environment every day we came into the office.